Drawing is more about how our brains interpret the information in front of us than what the hand is doing with the pencil. Having seen numerous drawings during my time teaching art, came across a common affliction, which appears as though the drawing is sloping to one side. I believe we are all biased towards one side of the world that we perceive. For instance, some people will be more aware of one side than the other. This bias will be reflected within the drawing which will appear to slope to one side or be squashed up on one corner of the page. The only way around this problem is to make the student aware of their crooked drawing problem. I find turning the drawing upside down or viewing it through the mirror effective in making the student aware of this sloping problem. The world that we see can be thought of as four divisions: upper left, lower left, upper right, lower right. If any of these fields of vision dominates the others or are imbalanced, the student will render an object with sloping lines, or contours to one side of the page. A way of redressing the balance in fields of vision perception is a simple drawing exercise that will force the brain to examine each four visual fields and how one relates with the other. 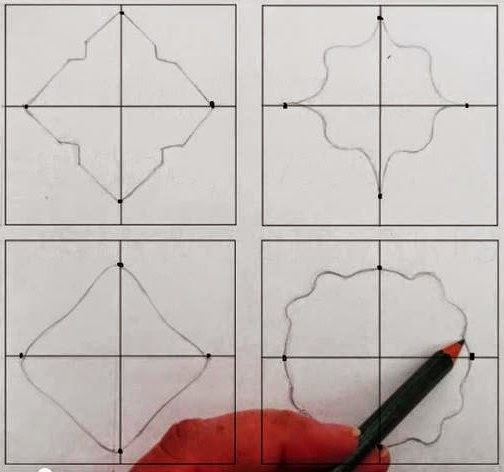 A way of forcing the brain to pay equal attention to all four fields of vision is to draw shapes with two lines of symmetry freehand. This means reflecting a line or contour accurately in all four quadrants. It is not as easy as it sounds. All that is needed is a sheet of paper, a ruler, HB pencil and an eraser. 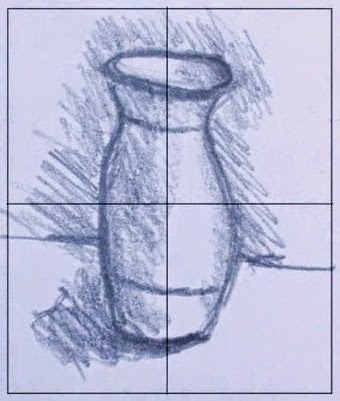 The video clip shows how to begin the drawing exercise. 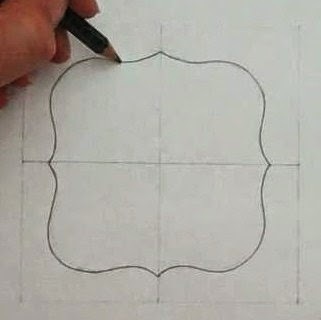 Draw a square, approx 5 -10 inches in size on the paper. Draw a faint cross through the middle of the square so that the square is divided into four. Now you will have four sections: Upper left, upper right, lower right, lower left. Place a dot on each line of the central cross that are equal in coordinate, as can be seen in the image. Now make a simple random line within one of the quadrants that begins and ends at a dot. It might be a curving line, a line with edges or a straight line, but ensure it is simple. Now turn the page to its side and try to reflect this line as a mirror image in the next quadrant, as shown in the video. Each line must meet up at a particular coordinate on the central cross of the square, creating a shape with two lines of symmetry. It won’t be perfect at first; this is OK. An eraser is allowed. Begin faint and then gradually work a little darker as the drawing is perfected. Keep turning and rotating the page this way and that, rubbing out deviant lines and checking for symmetry. This drawing lesson will force the brain to address all four visual fields, checking how one compares to the other. This drawing exercise forces the brain to examine all four fields of vision in drawing, helping to cure the affliction of wonky or crooked drawings. Keep practicing this exercise to keep wonky drawings at bay. Improvement will come with practice.